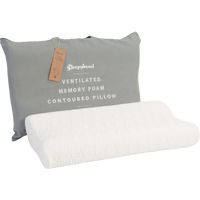 An advanced, ventilated Memory foam core that moulds to your body to provide the ultimate in contouring support and pressure relief. Ventilated core: Ventilation allows airflow and increased breathability. 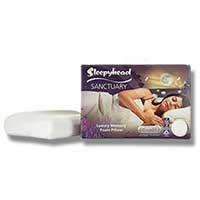 The Sleepyhead Sanctuary Memory Foam Pillow is made of high density Viscolux foam that has been treated with Health Fresh to help protect against a range of triggers that can cause allergies and asthma. Health Fresh: Treated with Health Fresh which helps protect against a range of triggers that can cause allergies and asthma. 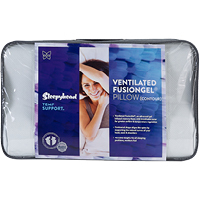 Sleep well with this ventilated gel infused memory foam pillow, assisting in temperature regulation. 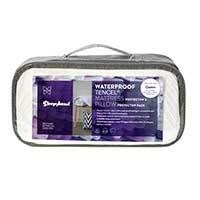 Our contoured memory foam is infused with gel particles for active support and moulded for consistent resilience. 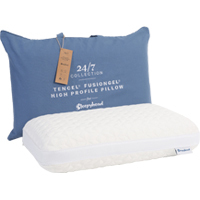 The Sleepyhead Silk Touch Advanced Memory Foam Pillow has been designed using technology and premium materials that work in harmony with a Sleepyhead Sanctuary mattress. Wool Silk: A blend of natural wool and silk that help naturally regulate temperature while remaining dust mite resistant. 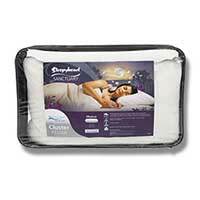 Individually formed clusters of memory foam that mould to you & provide a soft comfort level. Memory foam clusters: Individually formed clusters of memory foam that mould to your shape to provide comfort and support. Elliptical shape: designed to help cradle and support your head and neck. The Lodge king size pillow provides soft quilted comfort and features an extra wide design suitable for larger sized beds, such as a King, Super King and Californian King. 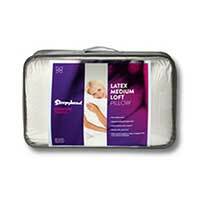 For those who like a soft feel, the Sleepyhead Luxe Spa king-size pillow is filled with plush fibre pods which interlock to provide restful comfort. Treated with Health Fresh to help protect against a range of triggers that can cause allergies and asthma. 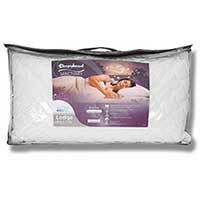 The Sleepyhead Sanctuary Elliptical Latex Pillow’s elliptical shape is designed to gently cushion your head and cradle your neck to create the ultimate in comfort and support. 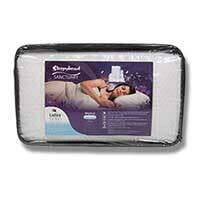 Natural Latex: With natural antibacterial properties to help maintain a dust free, healthier sleep environment. 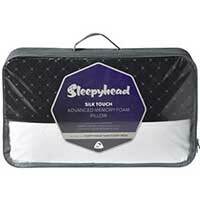 Gently contours to your head & neck offering support & comfort. Available with a Soft, Medium or Firm feel. 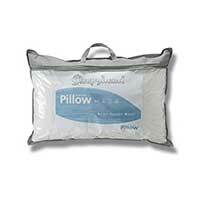 Experience great softness & comfort with this light & supportive bounce-back pillow. 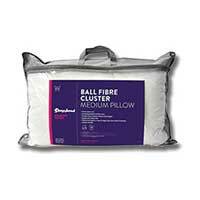 Ball Fibre Clusters: Interlocking polyester ball fibre pods for a low loft, yet soft pillow. Pure Cotton: Natural, durable, soft and absorbent. Rest your head on pure indulgence. 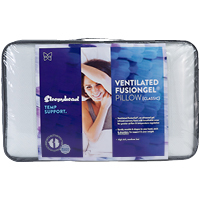 The luxuriously soft feel of TENCEL® and Cotton surrounds a Silk and New Zealand wool wrapped, temperature balancing gel-infused foam core offering exquisite levels of comfort support. 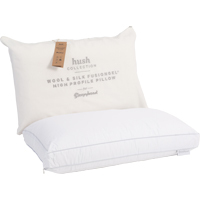 Plush high or Plush mid profile: Whether you’re a “side sleeper” needing a higher profile pillow or a “back sleeper” needing something a little lower, our range of pillow profiles ensures the perfect fit. 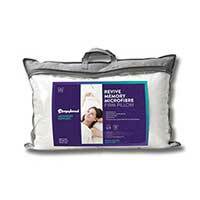 A soft plush pillow with hypo-allergenic fibre fill and featuring simple machine washable care. 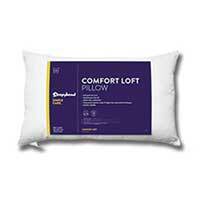 Medium loft and feel: Perfect for those that sleep on their side or back. Maintaining the right temperature in bed can be the difference between having a peaceful or disrupted sleep. 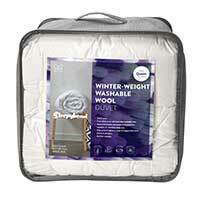 The right duvet will keep you comfortable and warm. 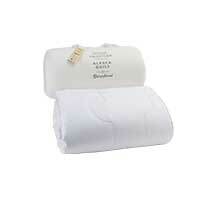 Enjoy the luxurious feel and warmth of this irresistibly silky duvet. 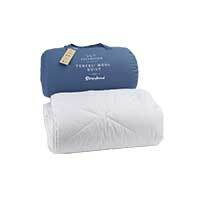 Sleep well with this breathable, natural New Zealand wool duvet. New Zealand Wool: Breathable wool assists in temperature regulation. A premium New Zealand wool inner with a soft, sheer 300TC Cotton TENCEL® cover to help keep you cool in the summer and warm in the winter. New Zealand Wool: Locally sourced wool is a hollow-cored fibre that has natural insulating properties help maintain the ideal comfort temperature. When the air is cool and damp, wool naturally wicks away excess moisture, making it an ideal choice all year round. Wrap yourself in luxury. A sheer, yet soft TENCEL® and Cotton cover surrounding New Zealand Alpaca, an extremely delicate fibre that provides a soft and luxurious feel. New Zealand Alpaca: Soft, durable, luxurious and naturally silky Alpaca is hypoallergenic and provides exceptional warmth for its weight. Alpaca naturally assists in temperature control, keeping you warm and dry in winter and cool in summer. 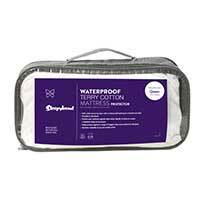 With a soft cotton terry top layer and waterproof backing, protect your mattress with a soft, waterproof and durable mattress protector. 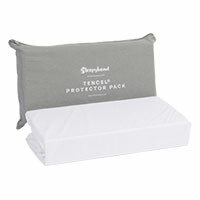 Protect your mattress and pillows from spills, stains and allergens with a naturally breathable, waterproof protector. 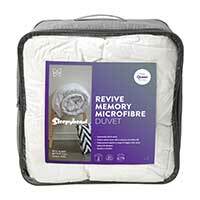 Stain-proof guarantee when used in conjunction with an eligible Sleepyhead mattress.